My husband Mike’s father, Condict Moore, died early this morning. It’s a sad time for all who loved and admired him, but he led a rich life of 98 years, filled with a passion for surgery and for family. He and my husband share a wonderful trait, to always be ready to celebrate the important and even the not-so-important events of life. When Mike and I traveled to Louisville to visit his parents, Condict always had champagne chilled (and even better, more expensive champagne that I buy for myself). Happily, his decline at the end was short, and even a few days ago he was coherent and making his own well-thought-out health care decisions. I’ll miss him. Here’s the weaving link. We came to Maine on Saturday, and I hoped to get a little time to weave on a newly-purchased Hockett loom. I bought it because I didn’t want to worry about airport security taking away the copper-pipe loom I use on non-airplane trips. The test I set for myself was making something coherent out of a jumble of yarn I threw in a bag at the last minute. 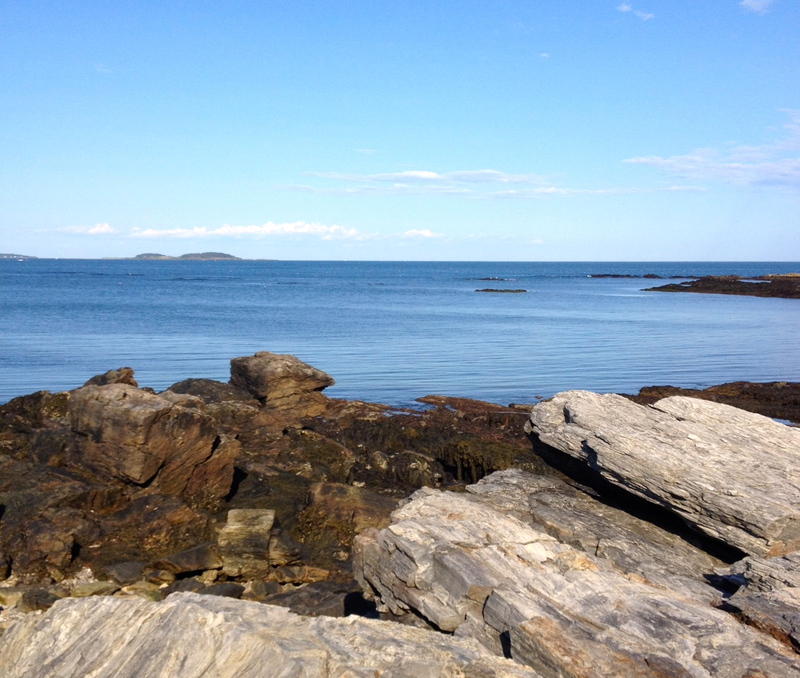 I chose to try to weave the rocks and water near the Maine house. 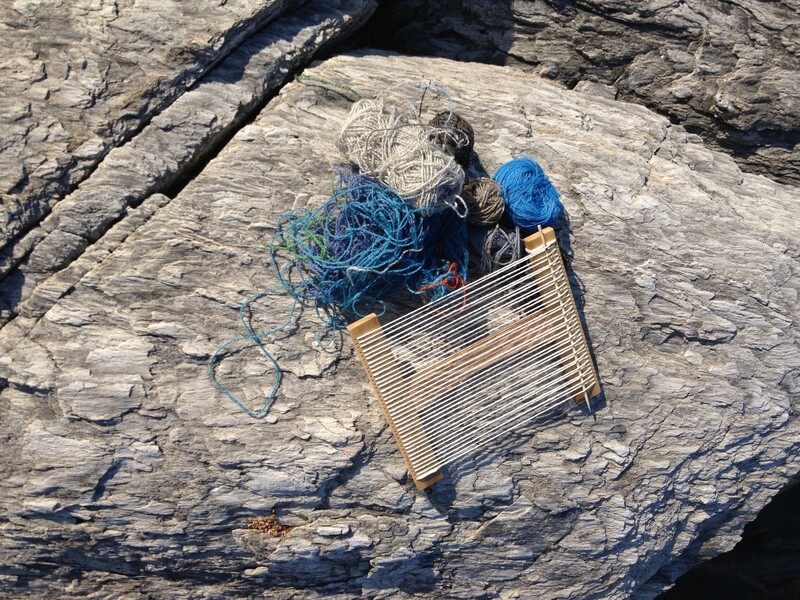 Here are the real rocks and my just-warped little loom. Here are my comments on the experience. I used some wool warp, and it sagged and stretched out and was awful. The Hockett loom, 5″ x 7,” is just too small. 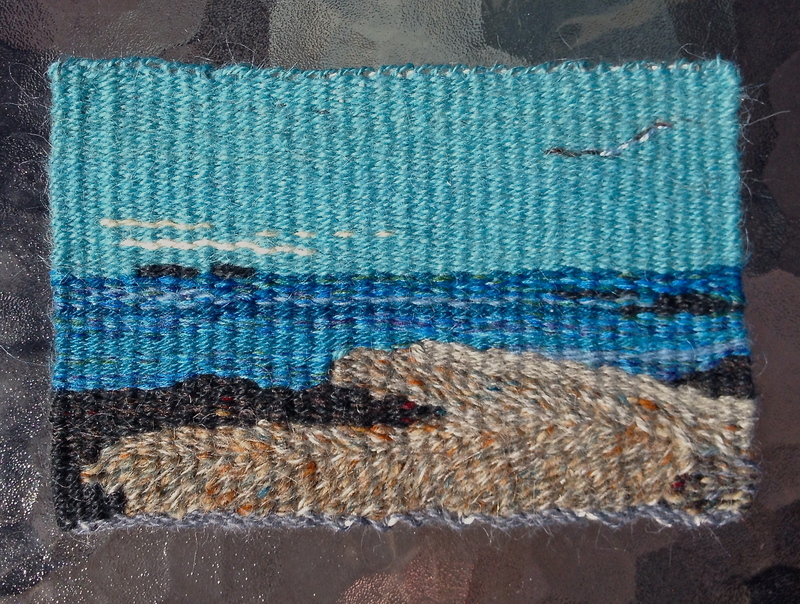 I tried making the rocks look rock-like by using eccentric, diagonal weft. Well, maybe that worked a bit, although my husband said, “Too bed the rocks have to look fuzzy. It’s just a little sketch-weaving, but instructional. It was meaningful because of the emotion-filled days when I wove it. P.S. 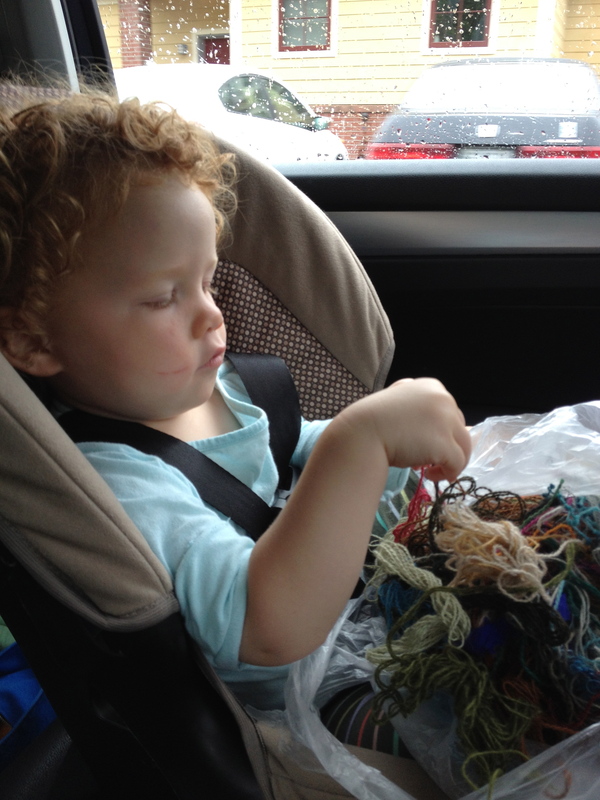 Another use for a jumble of yarn in a bag is entertaining granddaughter Madeline on a car trip on a rainy day. She called it knitting, as everything involving yarn or thread is “knitting.” Clearly, she needs instruction. So sorry to hear of your father-in-law. Just what size of Hockett would you have preferred?